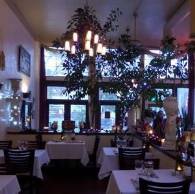 Since 1982, the Byzantion on Capitol Hill has been pleasing devoted customers with its authentic Greek gourmet cuisine and romantic, candlelit atmosphere. The chef and owner, Sotiri, a native of Greece, has been delivering superior and artfully seasoned Mediterranean fare for over 30 years. Using family recipes passed down through generations, Sotiri has developed an extensive menu that incorporates delectable, healthful, and memorable dishes to delight the senses and nourish the body and soul.